Like we've already told you, the HTC Titan II and Nokia Lumia 900 have practically identical CPU and chipset specifications. The Titan II has a slightly higher, 1.5GHz clock speed of its Scorpion core, and it shows in the trio of benchmarks we've prepared for you. The Titan II continued its dominance by getting a higher score in the BrowserMark as well - likely due to the extra 100MHz of horsepower on tap. The two devices managed an almost identical score in the FishIE test. Benchmark scores aside, keep in mind that there is absolutely no difference when using the HTC Titan II or the Nokia Lumia 900. Both handsets will offer you a silky smooth Windows Phone experience - much like any device sporting the OS, and regarding of its price tag. You must have noticed by now that, despite quite a few similarities, the Nokia Lumia 900 and the HTC Titan II have developed some quite different characters. The Lumia 900 wins the design contest. It is far more likely to turn heads than the generic looking Titan II. Build quality is top notch too, and so is the ClearBlack AMOLED display. The latter is possibly the best way to enjoy the Windows Phone OS. Our only grievance here is the slightly cheap and flimsy feel of the Lumia's hardware buttons. The Nokia will also last longer on a single charge than the HTC. The HTC Titan II on the other hand, is lighter, while being just as solidly built. Its bigger screen is likely to find some followers, despite its lower pixel density. It is also better equipped in the software department out of the box. The camera comparison is a rather curious tie between the two devices. The Lumia 900 takes better still photos. The HTC Titan II on the other hand, captures much better 720p videos, where the constant autofocus is not that big of a nuisance like in the case of the Nokia. 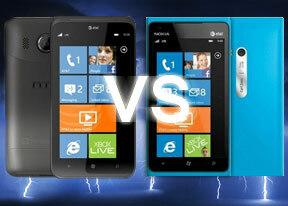 With the Nokia Lumia 900 enjoying massive coverage, and costing half as much as the HTC Titan II, it is easy to guess that it will outsell its rival by quite a margin. This doesn't mean however, that the Titan II is not a good Windows Phone handset - it easily stacks up to the Lumia, and even does better than it on more than one occasion.